This week’s Picture of the Week focuses on one of twenty protoplanetary discs explored and imaged by ALMA’s first Large Program, known as the Disk Substructures at High Angular Resolution Project (DSHARP). The disc is called AS 209, and its substructures are particularly pronounced thanks to its thin, high-contrast rings and almost face-on orientation towards us. Though concentric rings — shown here in particularly beautiful clarity — are a common substructure among such discs, their widths, separations, and number can vary greatly. It’s still unclear how these substructures form, and how planets emerge from them. Quantifying and studying these similarities and differences was a motivator for constructing ALMA, and was the main objective of DSHARP. These details may hold clues to the type of planetary system that will eventually emerge. 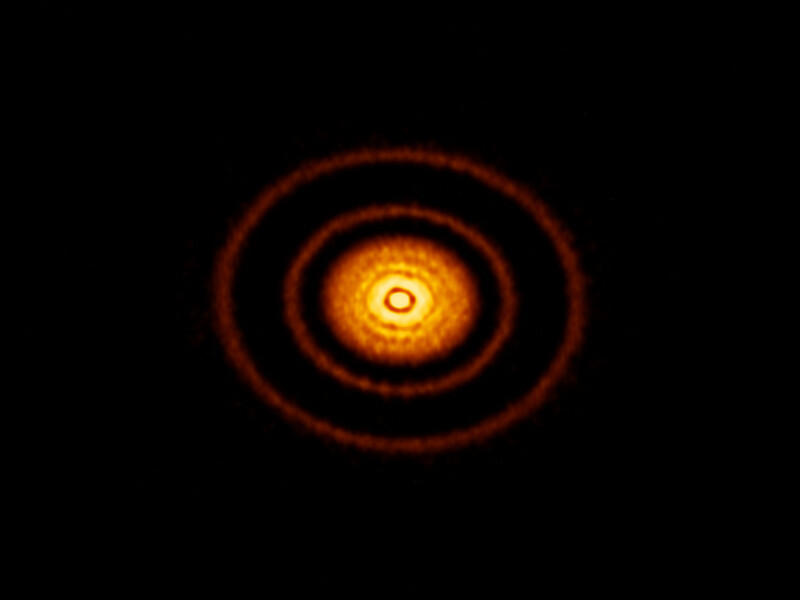 One interpretation is that there may be a rapid and complex interplay between young protoplanets and the disc itself far earlier in the evolution of the planetary system than previously thought. A leading theory of planet formation requires dust within these discs to clump into grains, then pebbles, and eventually planetesimals. This theory has always been stumped, however, by the fact that once an object reaches a certain mass, the dynamics of these discs would cause it to be sucked into the host star at the centre, thus halting its growth into a true planet. The results from the DSHARP program suggest that disc substructures may perturb these dynamics and provide safe havens where young planetesimals can continue growing — making the substructures observed here crucial to our own existence. Next week’s picture will be the final instalment in the DSHARP series, and will showcase another of the twenty images: this time a multiple star system. Position (Dec): -14° 22' 8.64"